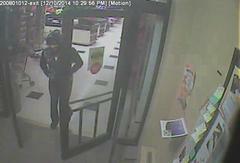 The Shorewood Police Department is seeking information on an armed robbery which occurred at Pick N Save on 12/10. On Wednesday 12/10 at approximately 10:25 PM, a male suspect along with a female accomplice robbed a cashier at the Shorewood Pick N Save, 4145 N Oakland Ave. 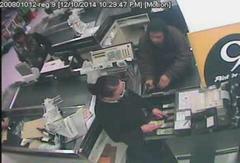 The male suspect approached a cashier with merchandise and handed the cashier a $10 bill. Once the cashier opened the cash register, the male pulled out a handgun, (possibly a revolver), and pointed it at the cashier demanding money. 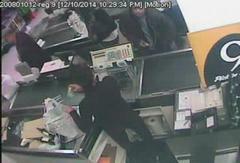 The cashier ran away while the suspect reached over and grabbed money from the drawer. Both suspects then fled from the store, no vehicle was seen. The male actor is described as being Asian or Black, 20's in age, medium build, black hair. He was last seen wearing a light gray t-shirt, black hoodie with the hood pulled up, dark gray jacket, baggie blue jeans and gray shoes. The female who was with the male was described as being Black, 20s in age, medium build, medium complexion, black unkempt hair. She was last seen wearing a gray, white, and black camouflaged hoodie with the hood up, tight dark jeans and black shoes. Attached are three surveillance pictures from the time of the robbery. If you can help identify either suspect or may have seen something outside of the store on Wednesday night, please contact the Shorewood Police Department at 414-847-2610.